Powerful batsman the late Sir Clyde Walcott and legendary West Indies fast bowler Reverend Wes Hall have been announced as the two cricket legends who will be inducted into the Sticky Wicket Hall of Fame in Antigua this year. Sir Walcott and Reverend Hall will join the other 14 members of the Hall of Fame, Sir Everton Weekes, Sir Garfield Sobers, Sir Vivian Richards, Sir Frank Worrell, Clive Lloyd, Ambassador Courtney Walsh, Curtly Ambrose, Malcolm Marshall, Lance Gibbs, Andy Roberts, George Headley, Michael Holding, Brian Lara, and Ridley Jacobs. Sir Clyde Walcott can be appropriately called Mr. Cricket. His entire life was dedicated to the game. From his early days at school until just a few years before he died, Sir Clyde was involved in cricket at some level. He represented Barbados and West Indies with distinction as a powerful batsman, wicket keeper and bowler; was a selector and manager of the West Indies team; and later was president of the West Indies Cricket Board (WICB) and head of the International Cricket Council (ICC). On the field of play, Walcott was a giant of a man. He was tall standing at six feet three inches and hit the ball powerfully especially off the backfoot. He combined with two other legendary Barbadians, Sir Frank Worrell and Sir Everton Weekes, to form the famous Three Ws, a triumvirate of batting experts, who carried with them the hopes, dreams and aspirations of Caribbean people all over the world. In 1994 he received a knighthood for his contribution to the game. Sir Clyde died on 26 August 2006 at the age of 80 and was buried next to Sir Frank, overlooking the 3Ws Oval at the Cave Hill Campus of the University of the West Indies in Barbados. 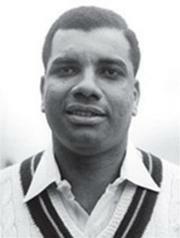 His immense contribution to West Indies cricket and the game worldwide will live on forever. Reverend Wes Hall is described as a man for all the people, all the time. Known as a fast bowler, selector, manager, administrator, politician, Reverend, Reverend Wes is also a father, mentor, hero, and friend. Hall fulfilled these roles and more as part of his immense contribution to the uplifting of the people of Barbados and the West Indies. Switching early in his career from wicket keeping to fast bowling, Hall quickly emerged as the first great post-war fast bowling hero of West Indies cricket. With his gold chain bouncing around his neck, he made the ball fly at the batsmans torso, and he also had a devastating yorker. After one of the longest run-ups in Test cricket, he bowled genuinely fast, and he could do it all day, as in his marathon spell in the famous Lord's Test of 1963, when he bowled unchanged for over three hours on the final day. His partnership with Charlie Griffith on that tour was the stuff of English nightmares. 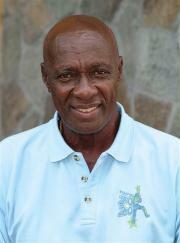 He was a selector and manager of the West Indies team and president of the West Indies Cricket Board from 2001 to 2003. During that period he sat on the board of directors of the International Cricket Council, where he pushed for better conditions for players in particular and West Indies cricket in general. He was the Minister of Tourism in Barbados in the 1980s and implemented many sports-related initiatives which have now been adopted globally. Today, at age 69, he continues to serve. He in an evangelical church leader and is on the board of directors for the Stanford 20/20 Cricket Project. The Sticky Wicket Hall of Fame was created by Antiguan financier Sir Allen Stanford in 2003 as a way to pay tribute to the outstanding contributions to cricket that have been made by individuals over the years. Persons nominated must have scored over 1000 runs or taken over 100 wickets at first class level at a minimum. There are also special nominees, other significant cricket personalities who do not meet the above two criteria but have made tremendous contributions towards the development of cricket within the region through work with local cricketers, participation on local cricket associations and promotion of West Indies cricket through their association with world cricket. These nominees can include umpires, cricket administrators and cricket journalists that have provided noteworthy service to West Indies Cricket for more than ten years.